WiFi is everywhere, and it’s connecting the world. Apple removed Ethernet interfaces from their Macintosh laptops long time ago. Tablets and smartphones only support WiFi connections for obvious reasons. Wherever people congregate, whether it’s a shopping mall, an airport, or a coffee shop, they expect a free WiFi connection. The same is true for enterprise organizations – most companies offer guest WiFi services to their visitors. Can you imagine visiting a business partner that doesn’t offer guest WiFi when you are scheduled to deliver a web presentation? How are you expected to present your slides stored in the cloud, without a guest WiFi SSID? In today’s multi-SSID world, monitoring a single WiFi network is not enough anymore. WiFi guests have the same expectations as business users: they demand a stable, well performing, and reliable WiFi service. Indeed, these new requirements impose more challenges to wireless engineers. Wireless engineers are now tasked to monitor multiple SSIDs: one for the employees, and one for the guest users, at minimum. Being mindful of this customer need and wireless engineers’ challenge, we recently released SSID hopping as part of NetBeez version 1.5. SSID hopping enables a single NetBeez WiFi monitoring sensor to test up to four SSIDs by regularly connecting to each one of them. 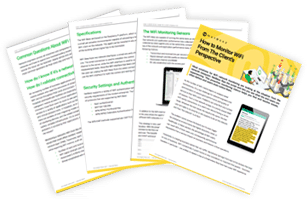 This advancement enables enterprise organizations to use one single sensor at each location to monitor all of their WiFi networks, without having to deploy one sensor for each SSID. 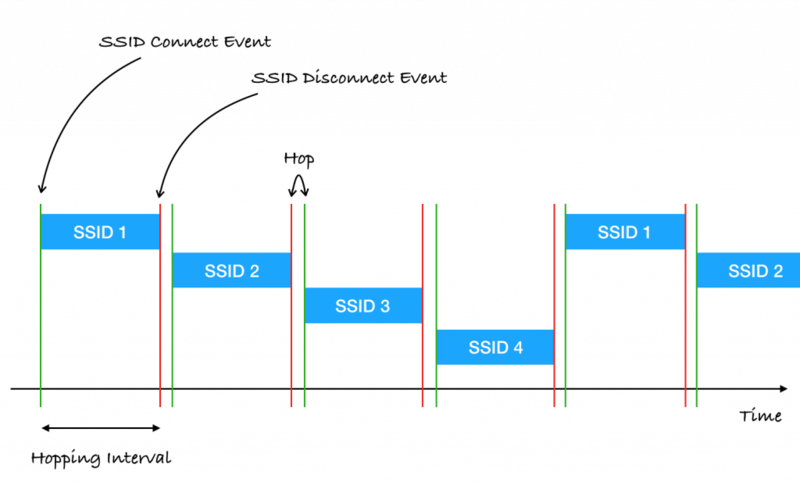 SSID hopping works by having WiFi sensors connect to SSID 1 for a certain amount of time, called the “Hopping Interval”, then disconnect and connect to SSID 2 for the same amount of time, and so on. At the end of the cycle, the WiFi sensors repeat the loop. At each hop, the WiFi sensors run user defined tests to web or cloud applications as well as network performance tests (such as iperf or Internet speed test) to measure network throughput. By default, the WiFi disconnection threshold is set to 60 seconds. This value can be overridden in the Anomaly Configuration section of the NetBeez dashboard. Today, most enterprise organizations broadcast at least two or more SSIDs for their end users. The first generally includes the corporate employees, while the second is primarily in place for guest users. No matter how many SSIDs are deployed at a company, wireless engineers have the difficult task of assuring user satisfaction. SSID hopping enables NetBeez users to monitor multiple WiFi networks without needing to deploy additional WiFi monitoring sensors.